Silk, silk thread, silver-gilt thread, hand-woven, hand-sewn. The waistcoat is made of pink silk brocaded with white and silver-gilt thread, lined with pink silk taffeta. The neckline is square at the back and V-shaped in front. It fastens in front with three silk bows - three original ties remain and there are two later replacements. There are six laps (tabs below the waist). 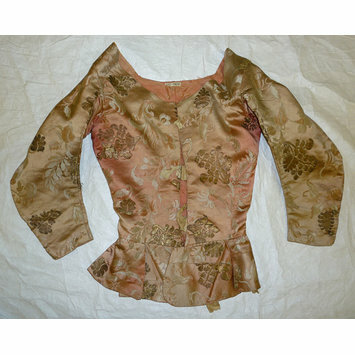 The sleeves are loose, curved and three-quarter length, fastening with two silver-gilt buttons at the wrist. The waistcoat has been made over from some other garment and is heavily pieced in areas. 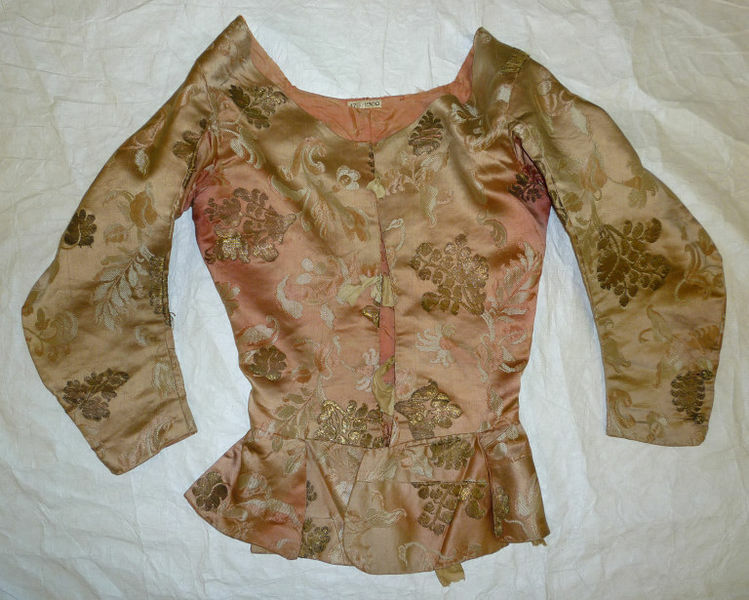 The silk brocade matches that on the cuffs of 176-1900, the wedding coat of Thomas Isham. Part of the Isham collection purchased in 1899.